The Pyrenean peaks and valleys of the Hautes-Pyrénées are a near permanent fixture on the Tour de France itinerary. As the name of the area suggests, cycling in this part of France is all about going up and down hills, making it a mecca for keen cyclists from all over the world. The Hautes-Pyrénées is home to no fewer than 16 cols and summit finishes featured in the Tour de France, alongside many other difficult road passes nearby. Names such as Col du Tourmalet, Col d’Aubisque, Luz Ardiden and Col d'Aspin can all evoke images of lean professional riders battling to be the first to the summit, but there are many other fantastic lesser known rides as well such as the road to Cap de Long or Gavarnie. A list of the climbs on offer is given below, plus more details of the 12 rides we personally tackled during our visit. If you're planning a cycling visit to the Hautes-Pyrénées it is necessary to wait until the ski season ends around the end of April and the cols are open again although if you're planning to go that early it's necessary to check the snow forecast as the roads might not be completely clear. Like all mountain destinations but especially in France, roads can get very busy during July and the start of August, but even then it's possible to escape the crowds by riding one-way routes, such as the climb to Luz Ardiden Ski Station or Hautacam. Weather permitting, it's possible to ride through to the end of October/early November as we discovered during our own adventures (we were in the Hautes-Pyrénées from mid-October to early-November). Given the density of big climbs in the Hautes-Pyrénées it is harder to avoid the climbs than it is to find them, but if you want to get the most out of your stay then it's worth noting the locations of your targets and the best starting points to make sure it fits with your plans. When you're in the area, local tourist offices can provide a wealth of information for free, suggesting possible loops and itineraries. Alternatively you can do what we did and buy a decent map (see below) to plan your own loops based on your abilities. Details of the climbs that we tackled, where we started and some recommended books are given in the rest of this post. The most popular climb in the Tour de France is tough from either side. We approached from Luz St Saveur, a 19km climb rising more than 1400m at an average of 7.4% with some sections exceeding 10%. Riding over the painted names of some of the world most talented and famous riders is motivating enough, but the scenery is stunning as well. The ascent from the north from Mauleon-Barousse is the steeper of the 2 sides, climbing 1185m over 19km averaging 6.3% but with some sections at more than 11% it's easy to see why this is a hors categorie climb. With most of the route winding through trees it doesn't have the sweeping views of some of the other climbs in the region, but the flattened col at the top provides a great view over the high mountains. Climbing out of the town of Bagneres-de-Luchon, this climb is just outside of the Hautes-Pyrenees, but worth a mention as it's short but steep ascent takes you right to the border with Spain. At just 10.2km with at an average gradient of 6.5% it is one of the easier climbs in the area. Taking on the ascent to Col de Tentes from Luz St Saveur is a 30km ascent at an average of 5%, climbing 1497m making it one of the biggest ascents in the area. However, we tackled this climb from Gavarnie (1375m) which, although still very tough, makes it a more manageable 800m ascent over around 9-10km (there are no waymarkers to provide a more accurate measure on the road). If you're really keen you can take a stroll from the col to Pic de Tentes (2322m) to get an amazing view over some of the Pyrenees highest peaks nearby. Despite not being used in the Tour de France, the climb to Lac Cap De Long, a mountain reservoir ringed by rocky summits of the Parc National des Pyrénées, is definitely the hardest climb in this list. At almost 24km long the climb begins gently for several kilometres but starts ramping up with most sections near the top in between 7-11%. Fortunately much of the climb is kept cooler by trees in the valley, although descending over 1300m continuously on a chilly evening was tough. 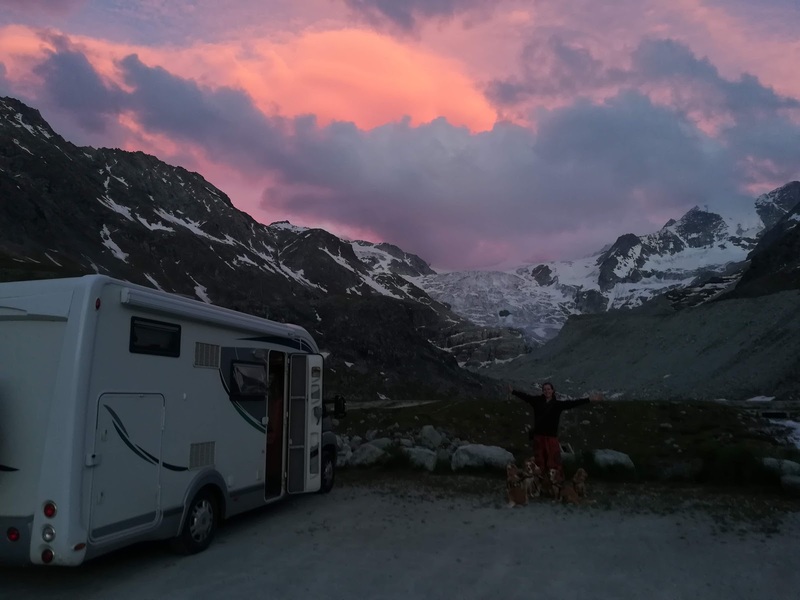 We parked our motorhome in the car park at Le Pont du Moudang, near Argnouet-Fabian, to begin this climb, although it would be possible to start the ride from Saint-Lary-Soulan as well.